In Everett, Boeing has begun construction of the second autoclave, scheduled to move into CWC (composite wing Center) later this year. Now housing a single autoclave, the CWC will eventually need to reach three full rate. For spar production, Boeing has erected two fabrication cells, allowing it to build a front and rear spar simultaneously. 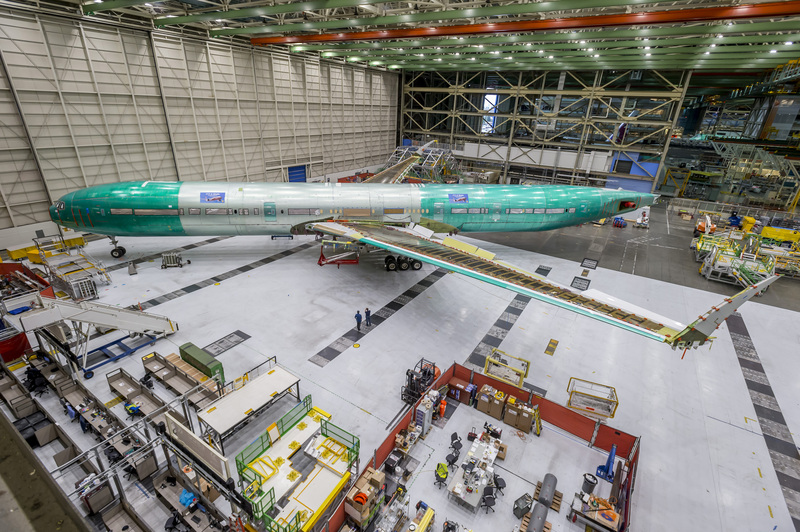 While the CWC also makes composite panels, skins, and stringers—86 of which go into each wing—the wing’s aluminum ribs are made in other Boeing facilities. In the meantime, at Boeing’s Seattle-area test facility, the company has completed more than 20 labs and has entered the lab-testing phase. One of the labs, called the integrated test vehicle(ITV), covers 12,000 sq ft and took about three years to complete. It tests all of the hydraulics and actuators, as well as folding wing operation, flaps, landing gear and various other items. Also in the test building sits what Boeing calls (Airplane), which took 33 months to complete. It began testing avionics and systems integration in March. Covering 11,000 square feet, it includes all avionics boxes,55 bays of equipment and 3,700 instrumented cables. Featuring 105,000-pound-thrust GE9x turbofans and structural improvements to the fuselage that will allow for a 6,000-foot cabin altitude, the airplane remain positioned to meet Boeing’s 2020 entry-into-service target, according to Boeing. For the fuselage, after much deliberation, Boeing chose to retain the aluminum design, while still incorporating not only a lower cabin altitude but also higher humidity levels and larger windows. Boeing’s familiarity with the legacy 777 allowed it to create an environment comparable to that passengers enjoy in the all-composite 787. In the opinion of this writer it is going to be another awesome Boeing product. 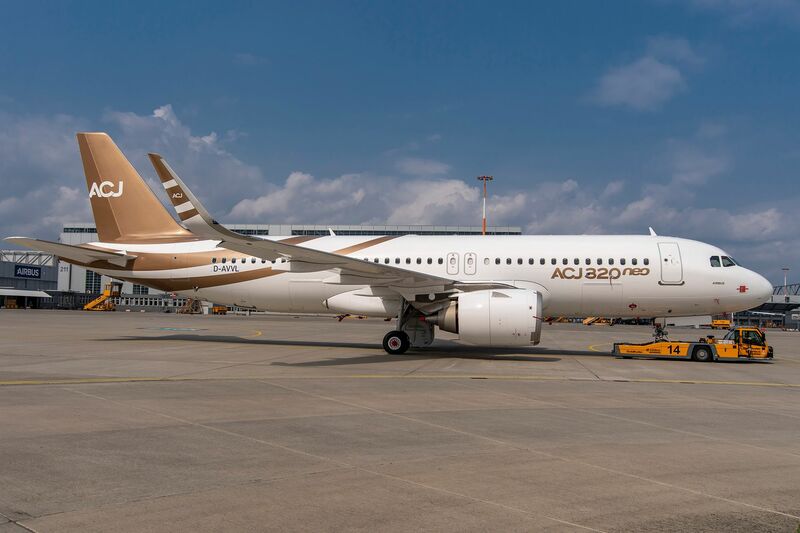 The first Airbus Corporate Jets ACJ320neo rolled off the production line in Hamburg, Germany, the company announced on August 16. Registered as D-AVVL, the airplane has been fitted with CFM International Leap-1A engines and painted in Airbus Corporate Jets’ house colors. Following delivery to UK-based Acropolis Aviation in the fourth quarter, the aircraft will enter outfitting at AMAC in Basel, Switzerland, where an Alberto Pinto-designed cabin will be installed. It will be repainted in the customer’s colors. Airbus ACJ320neo family aircraft feature new-generation engines and Sharklets, reducing fuel burn by about 15 percent and increasing range. According to Airbus, the ACJ320neo can fly 25 passengers 6,000nm, 11,100 km, enabling routes such as London to Beijing or Cape Town and Moscow to Los Angeles, while the ACJ319neo can fly eight passengers 6,700nm/12,500 km. ACJ320 family variants differ from their airliner counterparts by including a lower cabin altitude, build-in airstrips, and cargo hold that is reinforced to carry additional center fuel tanks. There are currently nine firm orders for the ACJ320neo family—three ACJ319neo and six ACJ320neo—according to Airbus. Boeing Business Jets has sold a BBJ Max 7 to Singapore company Seasons Trading. Although Seacons Trading chief executive Duty Purwagandhi says the re-engined narrow body was selected “because it offers more room and more range” than the company’s current line-up, it is unclear if it will replace the current BBJ or Gulfstream G550 it operates. “The BBJ Max 7 has features and capability that allow us to meet our very long-distance and demanding international flights with the best passenger comfort in its class,” adds Purwagandhi. Green deliveries of the 7,000nm(12,950km)-range, CFM international Leap 1B-powered BBJ Max 7 are scheduled to begin in 2022, with Asian operator Orient Global Aviation the launch customer for the type. Boeing says it has secured 20 orders for the BBJ Max family. The line-up includes the -8 and -9 variants—the re-engined variants of the BBJ2 and BBJ3, which are earmarked for green delivery in 2018 and 2020. Boeing set up its dedicated division for business jets in 1996 and since then has taken 259 orders and delivered 233 aircraft. As it nears certification for its new 7,700-nm flagship business jet, Bombardier Business Aircraft has retired the first 7500 flight-test vehicle—FTV1, dubbed “The Performer” — from flight-test duties, the Canadian aircraft manufacturer announced this week. ”On November 4, 2016, the inaugural flight test vehicle took to the skies for the first time,” it said. On September 7, 2018 it has officially completed all of its flight testing and is going into retirement. Mission accomplished. However, Bombardier said the aircraft itself is far from being retired. Instead, FTV1 has recently been painted at the company’s Global Completion Center, serving as a dress rehearsal for the paint shop, which was recently expanded to accommodate the larger model. The airplane will also be used as a demonstrator and appear at local company events ahead of the first production Global 7500’s expected service entry in the fourth quarter. In addition, Bombardier’s customer experience team is using FTV1 to validate all instruction manuals and procedural guidelines. Meanwhile, the company said the rest of its Global 7500 flight-test fleet—FTV2 through FTV5—is wrapping up the final testing. To date test aircraft have accumulated more than 2,700 flight hours altogether. Single-aisle aircraft will increase their dominance of global airline fleet as it grows over the next decade,AirLease executive chairman Steven Udvar-Hazy expects. 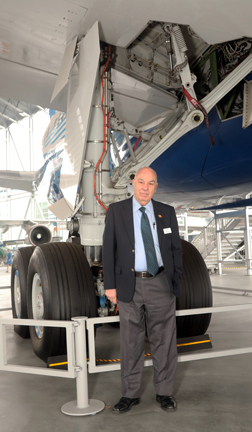 Speaking at an Aviation Club luncheon in London on September 13th, Udvar-Hazy said narrow bodies had upped their share from 70% to 75% of in-service commercial aircraft within a few years.” That trend will continue,” he predicts. He singles out Airbus’s longest-range narrow body, the A321LR, as a crucial aircraft in the medium market, suggesting that “we will see a lot more of them on transatlantic routes” because the variant offers “ close to the Boeing 757 capabilities, but uses 30 to 35% less fuel”. However, he says “the multimillion dollar question” is how Boeing responds with its New Mid-Market Airplane concept. Udvar-Hazy expects the airframe to make a final decision on The “797” by next summer. Ethiopian Airlines has suspended its planned order for at least 20 examples of the former Bombardier C Series following Airbus’s acquisition and renaming of the program now known as the A220.The airline engaged in an evaluation of the former Bombardier program for more than two years. However, now that the European airframes controls the program’s marketing, Ethiopian has decided to wait and gain a better understanding of Airbus’s plans. Now the airline is studying whether or not the Boeing 737Max aircraft order could eventually fit into the regional route network on which it intended the C Series to operate. Boeing’s firm order total for the largest of its 737 Max line rose to 417 on Wednesday August 29, as Virgin Australia said it would convert delivery positions reserved for 10 of 40 Max 8s on order to Max 10 positions. Australia’s second largest airline expects to take delivery of its first Max 10 in 2022, some three years after it takes the continent’s first Max 8 in November 2019. Brisbane-based Virgin Australia Group operates more than 130 aircraft, including more than 80 Boeing 737NGs.The addition of the Max jets forms part of a fleet modernization program expected to further boost prospects for a recovering domestic network. The Max 10 incorporates a pair of fuselage plugs to extend the max 9’s length by 66 inches. Other changes include a levered main landing gear, minor changes to accommodate the 777-style landing gear and four-inch-wider mid-exit door to allow for extra 12 passengers, bringing maximum capacity to 230 passengers. 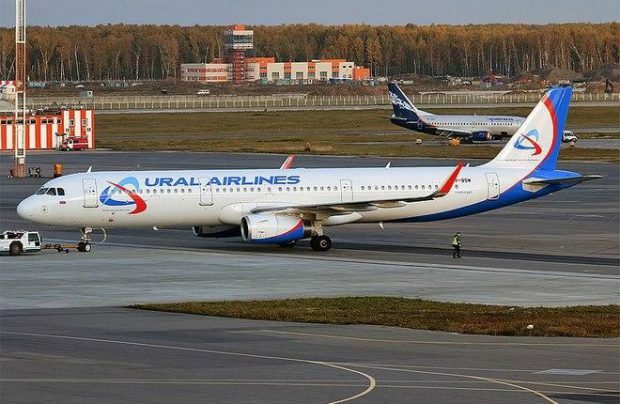 Ural Airlines of Russia is to diverge from its all-Airbus fleet having reached an agreement to lease 14 Boeing 737 Max jets. American Airlines CR Smith Museum reopened to the public on Labor Day following the successful completion of a redesign of its permanent exhibitions. Gulf Air has received its first Airbus A320neo, the airline will eventually operate 12 examples. First Airbus A380 has been dismantled and will be sold as spare parts as new lessee or buyer could not be found after a 10-year lease to Singapore Airlines. Luxair Luxembourg’s national carrier plans to acquire two Boeing 737-700s in 2019 to expand its route structure. Atlas Air has concluded a deal to acquire a Boeing 747-400 freighter from Lease Corporation International, increasing its fleet almost 40 examples. Corendon Airlines will introduce three more Boeing 737 Max from the beginning of next year. Ukraine International Airline continues its expansion program by acquiring seven new aircraft this year including a former Asiana Airlines Boeing 777-200ER. 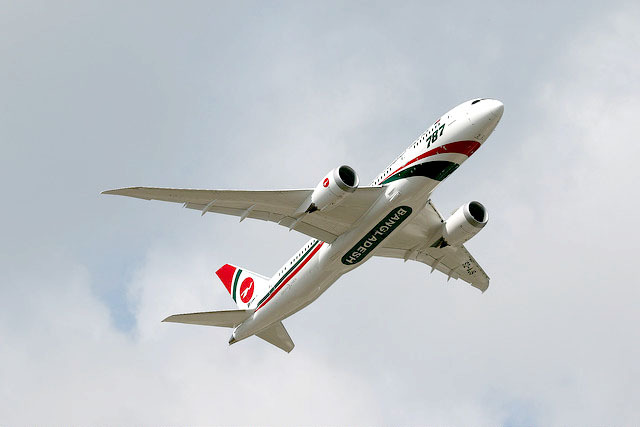 Biman Bangladesh Airlines put its first Boeing 787-8 into service on September 1. 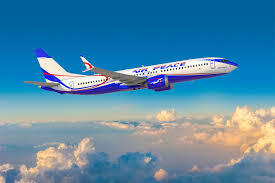 Air Peace announces an order for 10 737 Max aircraft from Boeing to expand its regional network. 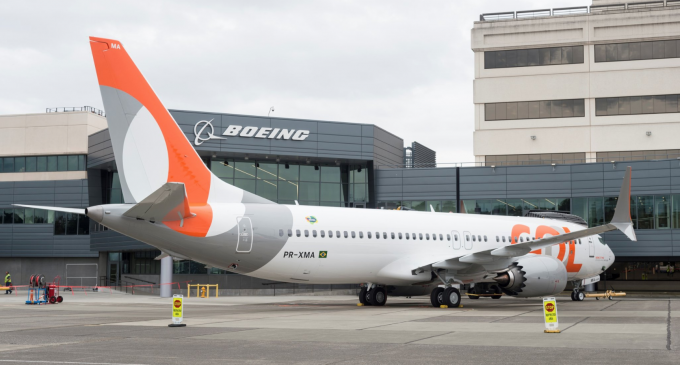 Brazil’s GOL unveiled its new Boeing 737 Max 8 at an event in Sao Paulo after taking delivery from Boeing. 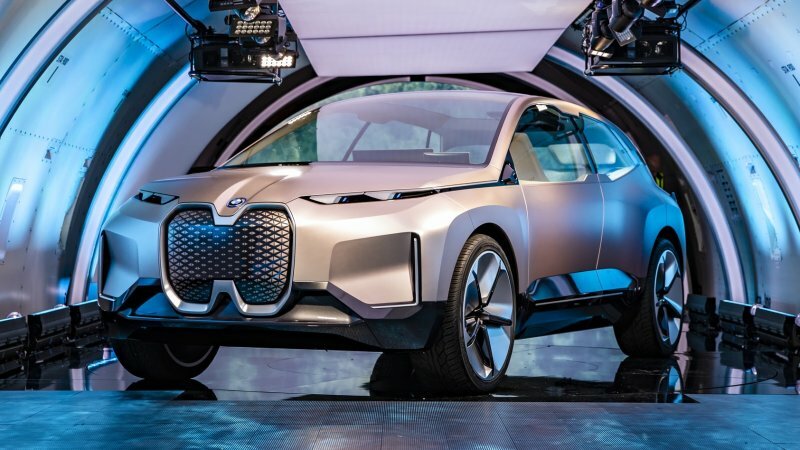 The BMW’s autonomous iNEXT electric crossover is no ordinary vehicle. And to launch it, BMW is taking to the skies. In a round-the-world sprint spanning Sept.9-11, BMW flew the iNEXT in a Boeing 777 Freighter to press events in Munich, New York, San Francisco and Beijing, before returning to Frankfurt. Four destinations on three continents in five days. 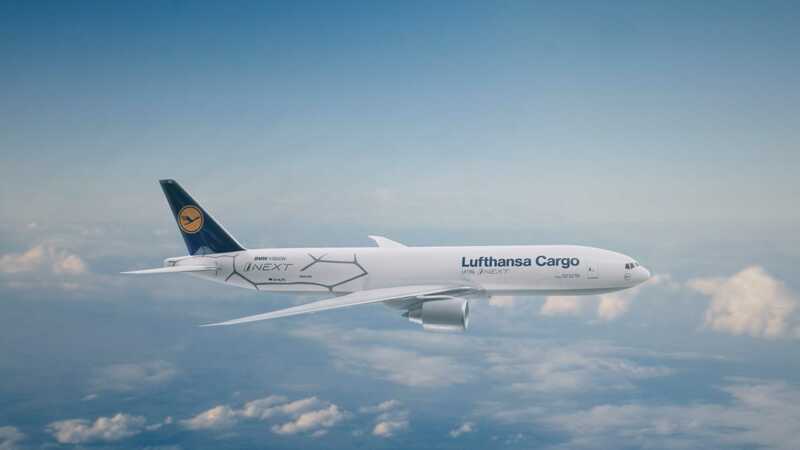 The BMW Group teamed up with the Lufthansa Cargo to present the BMW iNEXT World Flight as part of an event unparalleled in its execution. Preparation for the presentation event involved laying more than 7.5 km of wiring, while 78,000 LEDs in 165 Video LED modules and ten 13,000 ANSI lumen projectors will lit up a show inside the Boeing aircraft and that appealed to all the senses. More than 120 specialists in exhibition stand constructions as well as experts from Lufthansa Cargo and the BMW Group have played their part in making the project happen. Around 30 tons of material were used to construct a suitable platform on which to showcase the BMW Vision iNEXT. Timings were tight, given the need to turn the entire set-up inside the 777F from presentation mode to flight mode and back quickly and securely. The first guests were expected to arrive eight hours after the plane lands. And just four hours after the final presentation has been wrapped up at one venue, the 777 took off again for the next destination on its itinerary. Aircraft maintenance is rooted in touch labor and is likely to remain so for many years. New tools and materials sometimes make life easier for engineers, but human input still is invariably required. Threatening to shake things up, however, are new technologies such as robotics and artificial intelligence. 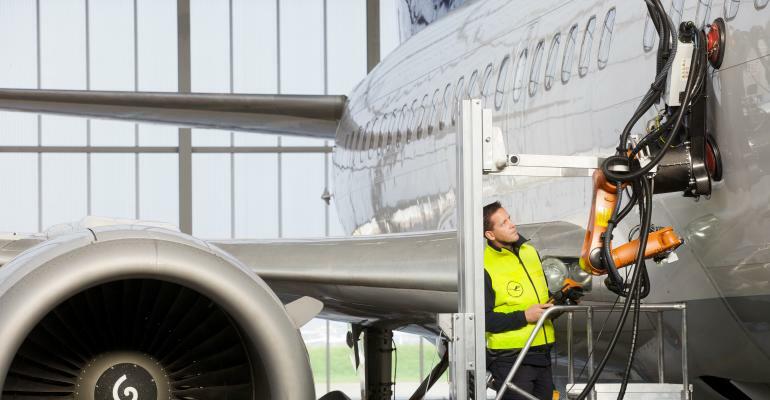 For example, Lufthansa Technik has developed an automated inspection and repair boot for combusted cracks, while several airlines have trialed drones for automated aircraft exterior inspections. With the inspection drones an engineer is still needed to review the results, but fault recognition technology may soon remove the need for human eyes. Most composite repairs are still done by hand, but automated processes will be an integral part of the aftermarket going forward—in part because of the imposition of stricter standards to inspection and repair procedures, which add to repair time if done by hand. Many of these technologies do not threaten to replace human workers. Instead, they offer productivity gains, quicker turnarounds and more accurate inspections. Looking ahead, a more interesting question is whether hardware or software improvements will offer the biggest gains for maintenance. Ameco launched Airbus A350-900 line maintenance services for air China. IAI is considering resuming its Boeing 747-400 passenger-to-freighter conversion program. KLM UK Engineering has an Alliance Airlines contract for Fokker 70/100 heavy maintenance. MTU Maintenance has a 3-year Jazeera Airways contract for CFM56-5B maintenance/repair.